It sounds so simple, but in today’s era of constant access to communication and technology, it can be a difficult habit to develop. Email, text messaging, blogs, Twitter, and Instagram were all intentionally designed to distract you from your agenda and move you to their agenda. One of the most effective ways to stay on your agenda is time blocking. Time blocking is simply breaking your day into blocks of time and then assigning tasks to those blocks of time. 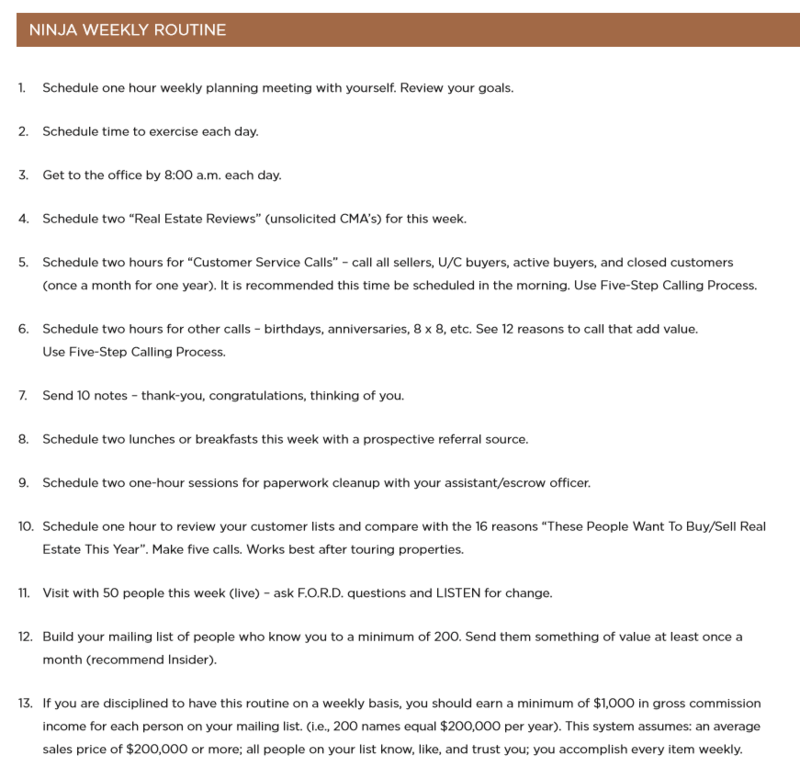 The Ninja System promotes working on your business in the morning and working in your business in the afternoon. From a practical standpoint, what does this mean? Notice in The Perfect Ninja Week that not every hour is time blocked and assigned a task. 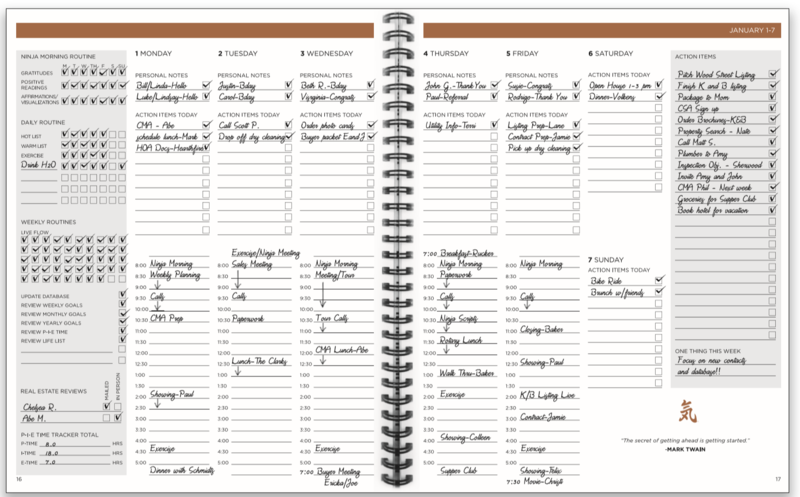 There is still plenty of room in the calendar to add events that may arise or deal with critical items that pop up. However, all of the tasks that are needed to stay on the Ninja Path are allocated a block of time to be completed during the week. For time blocking to work, you must actually do the task assigned during the time block. For example, if you have one hour time blocked to make phone calls put the “Do Not Disturb” sign on your door, turn off your computer, turn off all pop-up notifications on your phone, grab your FORD and RECORD sheet and start making calls. Do not do anything else for that hour. Don’t make five calls and then reward yourself with 10 minutes on Facebook. Focus, Focus, Focus! Remember, the goal of Ninja Selling is to increase your income per hour so you can have a life. Time Blocking is a great way to get more done in an hour, and if you can be more productive each hour, your reward will be more income per hour and more time to spend doing whatever you chose to do.